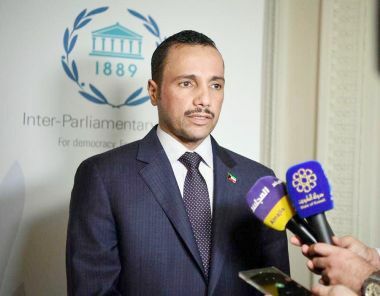 GENEVA-- Kuwait National Assembly Speaker Marzouq Al-Ghanim Friday called for amending bylaw of Inter-Parliamentary Union (IPU) in a way that imposed penalties on any member failing to comply with this bylaw. He was speaking to reporters after a preparatory meeting for the Fifth World Conference of Speakers of Parliament, to be hosted by IPU on Feburary 8-9. He said they discussed a mechanism to enforce IPU's bylaw to bring about compliance by member countries, including abidance by UN resolutions "which were violated by some countries." Kuwait therefore called on importance of amending bylaw in a way penalties are enforced on any member country failing to abide by this bylaw, said Al-Ghanim. The preparatory meeting also discussed future of democracies in the world and relations between IPU and the UN, he said. Al-Ghanim and Amal Al-Qubaisi, speaker of the UAE parliament, represented the Arab group in the preparatory meetings. He hoped the conference would have fruitful outcome that would be in interest of the Arab and Islamic affairs.